What, you do not know Camiguin? 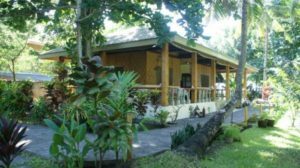 This small island in the southern Bohol Sea is a wonderful retreat to nature and original Philippine’s lifestyle. Since we live on the beach in Agoho we always had 2 to 3 couples of wild pigeons. They are Zebra Doves Geopelia striata. One of the couples always courts just out of our veranda. It is funny to watch and hear them. In January 2019, Madam Dove decided to build a nest on the lowest branch of one of our Champagne Palm trees. This is a rather risky place with all the heavy movements during strong wind. It can also be a very wet place under a heavy tropical downpour. But Madam must have had her reasons. By end of January she started to breed. One day in early February she flew away for a few minutes and we could see two small white eggs. Mister Dove flew in and out. And around 11 AM we could catch a short glimpse on the newly hatched baby dove. Unfortunately the picture taken is blurred. We’ll try again. It will now last about 20 days until junior will fly. If it’s a boy we’ll call him Valentino. If it’s a girl, she well get the name Valentina. March 3, 2019 Valentina & Valentino Farewell – have a safe trip Valentina & Valentiono have flown away. The final development of our two young zebra doves went on incredibly fast.